On the surface, the logic doesn’t hold up. But at the same time, the way Trump thinks about fake news points to a key reason why it works. In my recent research, I’ve been reverse-engineering fabricated news articles from the 19th century to analyze their logic, and I’ve discovered that fake news is effective because it tells you something about the world that you, in a way, already know. This may sound counterintuitive. But a look into the work of a 19th-century fake news writer helps explain this phenomenon – and what’s going on today. Fake news flourished in the 19th century. During that period, newspaper and magazine circulation skyrocketed due to innovations in printing technology and cheaper paper. Professional news agencies set up shop in major cities all over the world, while the telegraph enabled messages to be rapidly sent across continents. Reporting became increasingly standardized, with newspapers generally covering the same topics, adopting the same formulaic language and presenting stories in the same formats. Competition in this emerging, fast-paced news business was tough, and with growing standardization, editors needed to figure out ways to stand out from the crowd. One strategy involved sending foreign correspondents abroad. The idea was that the correspondents could provide stories and analysis from a personal point of view that readers might find more appealing than the standard, impersonal reports that emerged from news agencies. However, sending a reporter abroad was expensive, and not every paper could shoulder the cost. Those that couldn’t found a creative and much cheaper solution: They hired local staff writers to pretend they were sending dispatches from abroad. By the 1850s, the phenomenon was so widespread in Germany that it had become its own genre – the “unechte Korrespondenz,” or “fake foreign correspondent’s letter,” as people in the German news trade called it. The front page of a 1914 edition of the Kreuzzeitung. In 1860, Fontane – struggling to make ends meet – joined the staff of the Kreuzzeitung, an ultra-conservative Berlin newspaper. 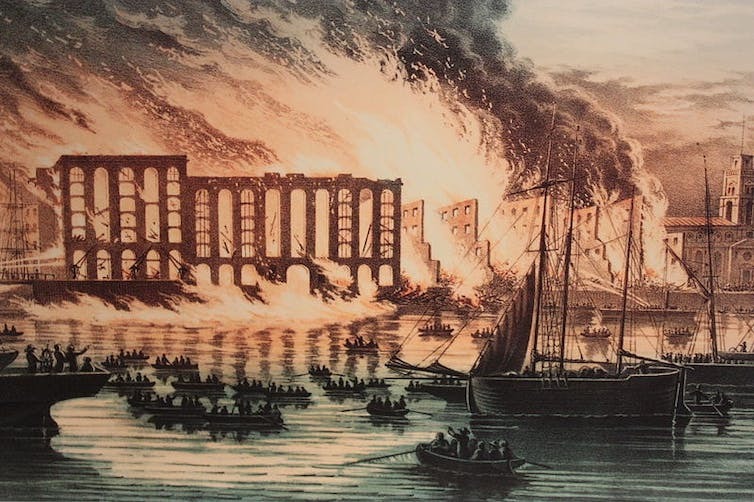 The paper assigned him to cover England, and for a decade, he published story after story “from” London, spellbinding his readers with “personal” accounts of dramatic events, like the devastating Tooley Street Fire of 1861. But during the entire decade, he never actually crossed the English Channel. The stunning thing – and the part that resonates today – is how Fontane pulled it off. Fontane’s story about the Great Fire illustrates his process. By the time he decided to write about the fire, it had already been raging for days, and reports about it were in virtually all the papers. Fontane sifted through these existing accounts to get a sense for what readers already knew about the catastrophe. He cut up the old articles, picked out the most relevant passages, and glued them together for his own account – this becomes clear from mapping his piece onto these sources. Then, to elevate the drama, he wrote some new passages with details and characters that were completely fabricated, such as a “companion” with special privileges who allegedly helped him cross the police cordon roping off the burning area. The 1861 Great Fire of Tooley Street. His readers probably believed him because his story confirmed a lot of things they already knew from prior press coverage. Fontane was careful to use familiar imagery, stereotypical descriptions and well-known facts about London. Meanwhile, he dressed up these familiar elements to make them more entertaining. His own piece was styled in such a way that it fit right in with what traveled through the 19th-century mass media communications circuit. Today’s fake news stories are also written from inside a closed mass media system. It’s one of the main reasons why these yarns – even the absurd ones – seem credible enough to get picked up: They recombine news bits, names, images, people and sites that we have already seen in similar contexts. Once this backdrop of credibility has been established, the sensational, made-up elements can be introduced all the more convincingly. Take one of the fake news masterpieces from last year’s campaign trail, the bogus story about stacks of ballot boxes that had “turned up” in a warehouse in Ohio and supposedly contained fraudulent Clinton votes. Cameron Harris, the 23-year-old college graduate who authored the story, later explained to The New York Times how he had approached the topic: He knew he had to connect his story to a familiar narrative in order to get it off the ground. Just like Fontane with his “companion,” Harris also invented a guy – an electrical worker and everyman – who stumbled across the ballot boxes in a little-used part of a warehouse. Harris quoted him and even added a photograph, showing a guy standing behind a stack of black plastic boxes. No matter that Harris had found the image on Google and that it pictured a British man: It fit with how readers might imagine an electrical worker and ballot boxes. Think about it: How much do you truly know firsthand, from personal experience, compared to what you know from schoolbooks, television, newspapers and the web? We like to think that we select the media that then shape and become part of our reality. That’s no longer how it works, though. Since the second half of the 19th century, the mass media have been shaping their own reality and narratives. In early 2016, Americans spent almost 11 hours each day staring at screens. These data do not even reflect the phenomenal increase in news consumption during the tail end of the presidential campaign and the election. And in this vortex, it can be tough to discern what’s fake and what’s not.